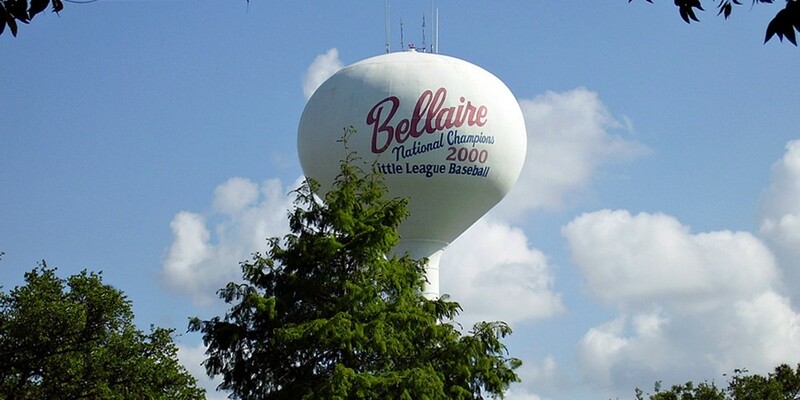 Photograph, Picture of the Bellaire watertower. Image available on the Internet and included in accordance with Title 17 U.S.C. Section 107. BELLAIRE, TEXAS. Bellaire, on Interstate Loop 610, is surrounded by Houston, West University Place, and Southside Place in southwest Harris County. William Wright Baldwin, acting as president of the South End Land Company, founded Bellaire and Westmoreland Farms after purchasing the 9,449-acre Rice Ranch in 1908. Baldwin was a native of Iowa and nationally known as vice president of the Burlington Railroad. The development was six miles from Houston on the eastern edge of the Rice Ranch, so named for former owner William Marsh Rice. Promotional advertising in 1909 explained that Bellaire was named for the area's Gulf breezes, but Baldwin may have named it for Bellaire, Ohio, a town served by his railroad. By 1910 Baldwin had invested over $150,000 in capital improvements to turn the treeless prairie into an attractive location for residences and small truck farms. From the site to Main Street in Houston he constructed Bellaire Boulevard. He also incorporated the Westmoreland Railroad Company to build an electric streetcar line down the center of the boulevard. The streetcar, known as the "Toonerville Trolley," operated from December 12, 1910, until bus service replaced it on September 26, 1927. In 1910 horticulturist Edward Teas was induced to move his nursery from Missouri to Bellaire Boulevard to implement landscaping plans drawn by landscape architect Sid Hare. A Bellaire post office opened in 1911. The Toonerville Trolley operated from 1910 to 1927. Image available on the Internet and included in accordance with Title 17 U.S.C. Section 107. The South End Land Company advertised nationwide to attract Midwestern farmers and others who were eager to escape harsh winters. Bellaire was promoted as an exclusive residential neighborhood and agricultural trading center with the conveniences of city living and reliable access to Houston. On June 24, 1918, with a population of about 200, Bellaire obtained a general-law city charter. The population reached 1,124 by 1940. Houston's expansion after World War II transformed Bellaire into a popular suburb, but geographical growth was halted when Houston annexed the surrounding land on December 31, 1948. In April 1949 Bellaire adopted a home-rule charter with a council-manager government. The city had 10,173 residents in 1950. The Swedish general consul's office opened in Bellaire in 1953. At one point, the city was also home to the consulate general of Honduras. However, both offices had relocated to Houston by 2009. Bellaire is zoned for residential, commercial, and light industrial sections. High-rise office buildings are located along Loop 610, but Bellaire is largely known as a residential city. Zoning and land-use controversies, long the stuff of Bellaire politics, led to a recall of the mayor and three councilmen in 1977. A resurgence in new residential construction began in the late 1980s following a liberalization of the city's traditionally strict zoning policies. By 1968 Bellaire had fifteen churches and one synagogue. Leading community organizations included the Bellaire-Southwest Houston Chamber of Commerce (now part of the Houston Metropolitan Chamber of Commerce), the Bellaire Historical Society, Friends of the Bellaire Library, Friends of Bellaire Parks (now Patrons for Bellaire Parks), and the Bellaire Women's Civic Club. In 2017 there were three private schools and several public schools operated by the Houston Independent School District. Local publications included the Bellaire Examiner, the Village & Southwest News, and Bellaire Buzz magazine. City management is noted for its police and fire protection, library, public works, parks and recreation facilities, and an office for senior services. The population was 19,872 in 1960, 13,842 in 1990, and 16,855 in 2010. By 2016 the population grew to an estimated 18,584. Bellaire Texan, November 25, 1971, June 5, 1974. Mrs. Robert N. Gay and Mrs. J. W. Hawks, Bellaire's Own Historical Cookbook (Bellaire, Texas: Bellaire Women's Civic Club, 1969). A History of Bellaire (Bellaire, Texas: Greater Bellaire Chamber of Commerce, 1971). Vertical Files, Dolph Briscoe Center for American History, University of Texas at Austin. 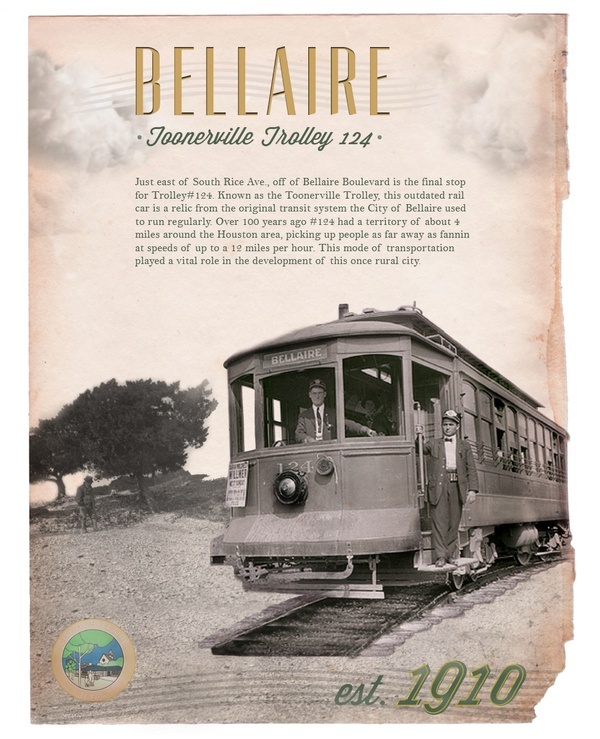 Handbook of Texas Online, Jeffrey D. Dunn, "BELLAIRE, TX," accessed April 24, 2019, http://www.tshaonline.org/handbook/online/articles/heb05.